FLINT, Michigan — The game of the week in the MCCAA Wednesday night didn’t disappoint. The no. 3-ranked Stars, fresh off a win over no. 1-ranked Schoolcraft, needed a furious comeback in the game’s final two minutes to earn a 77-74 win. The victory is Lansing’s second over Mott this season and the first home loss against Lansing since 2009. Lansing’s win over Mott last month was also by three points. Lansing had not swept Mott in a season series since 2002. One of those obstacles, if the pointed words from Mott’s bench are any indication, was the free throw disparity in the game: 33-16 in favor of the Stars. Even so, it was the Bears’ lack of execution on the offensive end in the final minutes that cost them the game. Mott (6-3), paced by freshman guard Diandre Wilson, led by a point at the half and by as many as 10 midway through the second half. Wilson scored from all over the court, leading all scorers with 28 points. Once the Bears’ lead cracked double digits with 13 minutes left in the game, their overall play took a serious nosedive. In spite of several turnovers, a couple questionable calls and even more questionable shots, the Bears were still staked to a five point lead with two minutes left. Two easy baskets for Lansing coupled with a terrible cross-court pass for a turnover and foul by Jalen Adams and the Bears’ lead was history. Mott only managed one basket, a putback off a desperation shot at the buzzer by Mitchell Rubio, in the final two minutes. Lansing went 6-for-6 from the foul line during that span. Adams, a D-1 transfer from St. Bonaventure, had his worst game as a Bear Wednesday night. He scored eight points (two in the second half) and didn’t appear to be heavily invested in a positive outcome in the game. Mott head coach Steve Schmidt, seething after a tough loss, went off script. Just in terms of sheer talent, Adams probably should be Mott’s best offensive player. He’s a 6-foot-5 guard with all the physical tools. That he’s not their best is drawing the ire of his coach because, at least on the surface, it appears effort is all that’s standing in his way. All signs pointed to this game being a banner win for the Bears. For the second time this season, Mott held Javon Haines to well below his average (29). Haines scored 12 points but only managed one basket thanks, in large part, to the play of freshman Cedric Moten and sophomore Lorenzo Collier. This outcome is eerily similar to the first go around in Lansing (12-1). The Bears held Haines in check but simply couldn’t defend the post against Jimmy Kodet and Isaiah Green. The pair combined for 33 points. Mott, once again, made Kodet look like Dirk Nowitzki. All is not lost, however. The Bears have taken the best JUCO team in the state to the wall now twice. They just need to learn how to finish. Six of Mott’s next seven games are on the road, including a bruiser against Muskegon on Saturday afternoon. 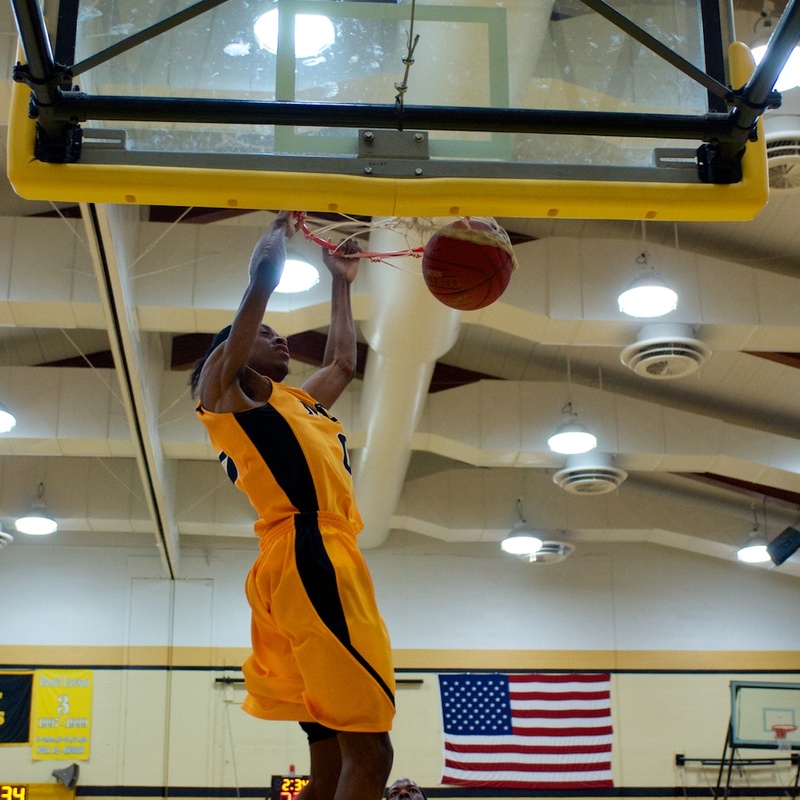 The Bears’ next home game is December 30 against Marygrove College JV. Listen to the Bears live on MRSN.us. FLINT, Michigan — Two of the top junior college basketball programs in the Midwest locked horns on Friday night in Flint. Just as one might expect, it went down to the wire. The game featured seven ties and nine lead changes. It finished with an impressive win for the undefeated Bears, 73-67. Mott, fresh off an important win over Muskegon on Wednesday night, didn’t play particularly well against a much bigger Triton squad. The Bears used their speed in the open court to score in transition and to get to the foul line, but easy baskets were nowhere to be found. These are two very good teams. The game was tied at 34 at the half. The turning point in the game came with 90 seconds left. After a 3-pointer by Triton’s Greg Carter cut Mott’s lead to six, Mott sophomore guard Jalen Adams buried a 3-pointer of his own on the ensuing possession as the shot clock expired. The teams traded baskets, free throws and timeouts the rest of the way. The triple by Adams was the high water mark in an otherwise forgettable game for the 6-5 shooting guard. He scored 11 points on 3-for-14 from the field. He wasn’t alone, however, as the Bears shot just 33 percent from the field as a team. For the second straight game, freshman Diandre Wilson led all scorers with 17 points and eight rebounds. Cedric Moten and Lorenzo Collier scored 12 and 10 points, respectively. Percell Washington led Triton (3-1) with 16 points and 11 rebounds. The Bears (4-0) will return to action at 7:30 p.m. on Wednesday night on the road against rival Lansing CC. If the Bears win against the Stars, they will almost certainly be ranked in the next NJCAA poll. At the conclusion of the game, Triton head coach Steve Christiansen told Mott coach Steve Schmidt that he’d see him in Danville. Let’s hope he’s right. Listen Mott basketball live all season at MRSN.us. FLINT, Michigan — What a difference a year makes. Just nine months removed from his worst season as a head coach in two decades, Mott head coach Steve Schmidt got his swagger back. 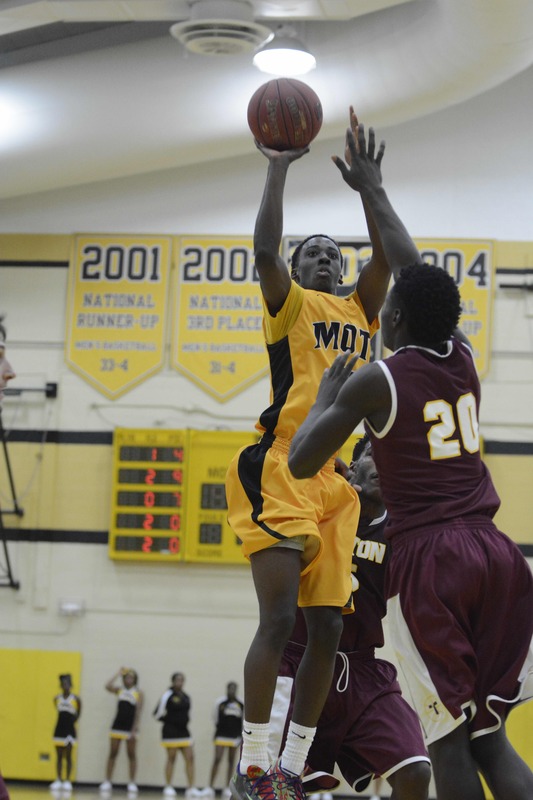 Mott (3-0) had its first big test of the season on Wednesday night against Muskegon, one of the top teams in the MCCAA. The Bears passed with flying colors, cruising past the Jayhawks, 93-79. Lansing, Mott’s opponent next week, may have something to say about that. But, suffice it to say, Muskegon is really athletic and loaded with experience. The Jayhawks, led by sophomores Aaron Sydnor and Will Robertson, hung around for the entire half, scoring at the buzzer cut Mott’s lead to two, 38-36. To put it mildly, the second half featured wild swings of momentum for both teams. Mott led by 10 with 11 minutes left in the game. Two and a half minutes later, the Bears’ lead was down to one. Two and a half minutes after that, Mott led by 16. That’s not a misprint. The Bears’s final run was led by 6-3 freshman guard Diandre Wilson, who stuffed the stat sheet with 23 points, five assists, five boards and six steals. He scored six points in a span of less than 30 seconds to put the game away with five minutes left. The exclamation point on the win came late on a ridiculous alley-oop to sophomore Jalen Adams, a D-1 transfer from St. Bonaventure. Adams scored 15 points with four rebounds and three assists. That was one of many dunks on the night from a team that, at least on the surface, looks to be Mott’s most athletic bunch since the days of Doug Anderson and Torian Oglesby (the “fly boys”). The best dunk of the night came early, a rather shocking slam in transition from freshman Aaryon Davis, generously listed at 5-10. Former Flint Beecher all-stater Cedric Moten started for the Bears, scored 13 points and showed the ability to stop the ball. He may well be the “glue guy” that Schmidt has always featured on his championship teams. He’s not as athletic as former Bear TJ Cameron (Kalamazoo Central), but he brings a lot of the same qualities to the program. If the first three games of the season are any indication, this is a team that will win games by out-running and out-jumping their opponents. It’s going to be a little different than Mott’s great teams of the past; but, if this group stays together, they will win a lot of games. The Bears have a quick turnaround this week, as they welcome Triton College (Illinois) to Ballenger Fieldhouse at 7:30 p.m. on Friday. Triton is also 3-0 including a recent win over Cincinnati State. Listen to the game live online at MRSN.us. Mott’s Malik Albert signed with Creighton University last month. Malik Albert, among the most electrifying athletes to ever come out of Mott Community College, resurfaced at Creighton University last month. Albert was off the radar after a year away from competitive basketball to work on his academic credentials. Albert, a 6-2 combo guard from Detroit, is among the most prolific scorers during head coach Steve Schmidt’s tenure at Mott. Only Jeremie Simmons (Ohio State) scored more points in his career at Mott than Albert (1,248). 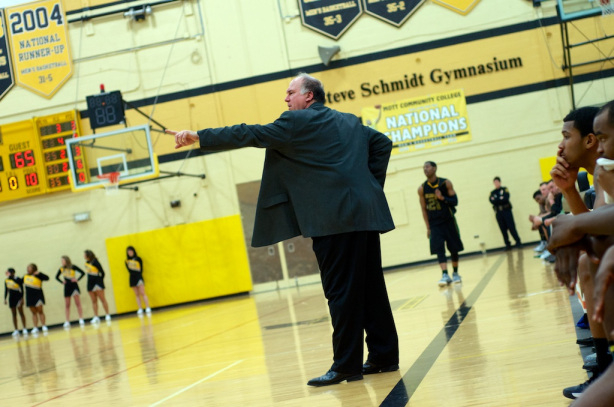 Albert is one of the 18 Division II junior college All-Americans who have played for Schmidt in his 24 seasons at Mott. Though the coach is proud of what Albert achieved on the court, Schmidt is even more impressed by what he did off it. After two seasons at Mott, Albert had to sit out last season to finish up academic requirements for his associate degree. “I’m very proud of him for persevering through the academic challenge,” Schmidt said. “He earned this opportunity. In this day and age, a lot of people cut corners and take shortcuts. It’s tough to call Albert an underachiever at Mott, based on his team’s winning percentage and his personal accolades. That said, Albert is a very rare athletic talent who just needed some more time to get his life together. I think anyone who watched him for two years at Mott would agree that his best basketball is ahead of him. He’s had the tools; add the desire and the sky’s the limit. And if you’re curious, the reporter put Albert’s vertical jump at over 40 inches. 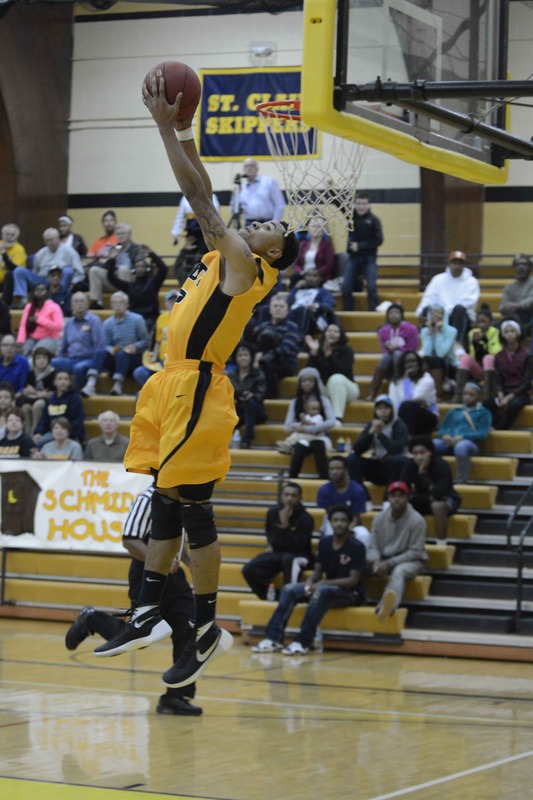 FLINT, Michigan — Beecher’s all-state and state champion small forward Cedric Moten scored 24 points Friday night to lead the Black Team to victory in the 23rd annual Bruin Club Classic at Mott Community College, 116-114. The game featured 26 of the Flint area’s top graduated seniors coached by former Mott National Player of the Year, Kevin Tiggs, and former MSU standout Antonio Smith. The packed house at the Steve Schmidt Gymnasium got their money’s worth — 230 points and double-digit dunks. Moten did for the Black Team what he’d become known for at Beecher: he’s everywhere all at once. It’s easy to spot Moten at a moment’s notice — just find the ball. 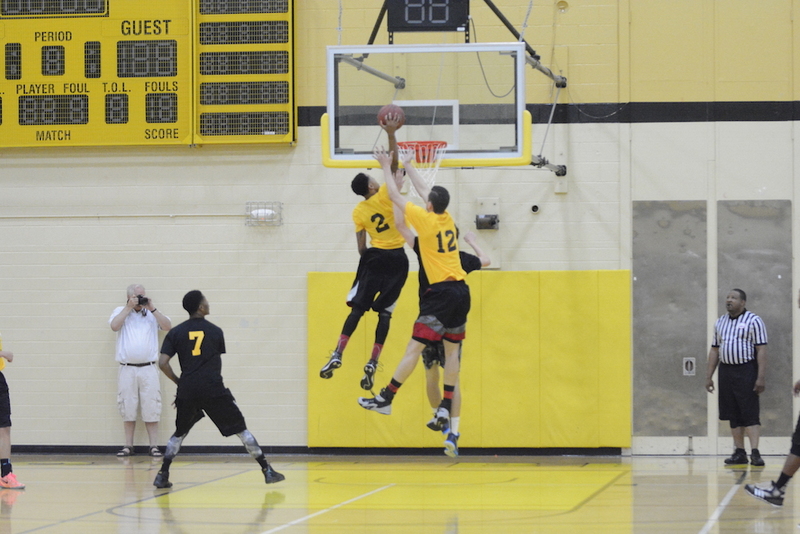 For the Gold Team, Davison standout and future Lewis University big man Frank Vukaj was a beast offensively. He had several dunks and one impressive block on a clear out. He’s a rare bird for these parts — a skilled big man. He scored 28 points in a losing effort. 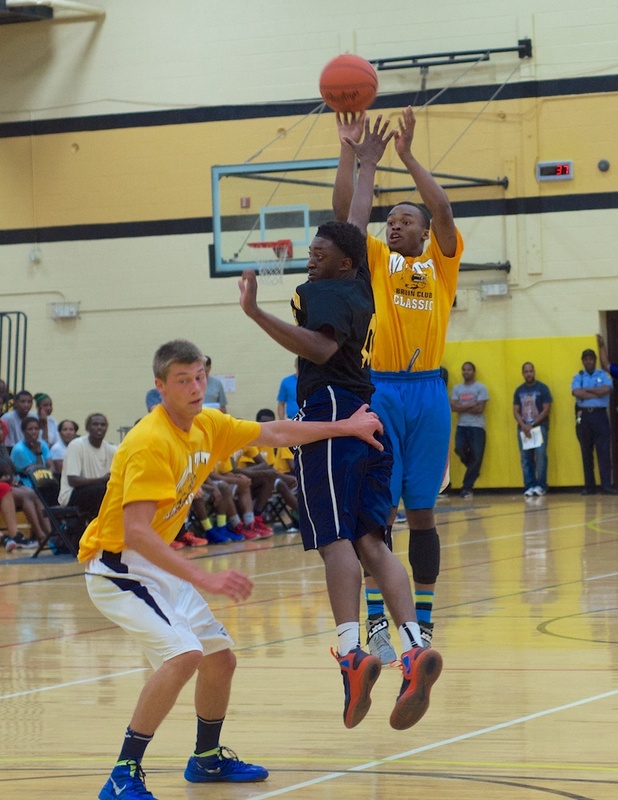 The game also featured two of the state’s highest flyers, Northwestern’s Rashad Johnson and Hamady’s Jalen Fykes. The latter actually climbed the ladder on the first possession of the game for a highlight dunk. Johnson, for his part, poured in 28 points to share game-high honors with Vukaj. Johnson’s teammate from Northwestern, Deonte Hopkins, scored 20. Flint Southwestern’s top player, Neshua Wise, added 18. Beecher’s sharpshooter Sammy Toins scored 19 and Southwestern’s Quavon Trawick added 14. Holly’s standout guard and future SVSU Cardinal Jake Daniels missed the game due to an illness. Here are the invitees for the 23rd Annual Mott Bruin Club Classic to be held Friday, June 26 at Mott Community College in Flint. This game will feature the Flint area’s top seniors. The teams will be coached by former Mott National Player of the Year Kevin Tiggs and former MSU forward Antonio Smith. If your name is on this list, please send an e-mail to [email protected] to confirm your spot in the game. You can also confirm via direct message to @jaredfield1 on Twitter. We also have a list of alternates for this game in case there are players who cannot attend. Players should arrive no later than 7:30 p.m. on game day for an 8 p.m tip. Mott Community College had one job on Wednesday night: Beat Macomb and secure a home game in the first round of the MCCAA District 10 Tournament next Tuesday night. The Bears, as they have all season, failed to play a complete game and ultimately fell to the Monarchs, 62-57. With the win, Macomb earns the fourth seed in the District 10 Tournament and will host Wayne County on Tuesday night at 7 p.m. The Bears earned the sixth seed and will travel to Delta Tuesday night to play the Pioneers at 7:30 p.m. Delta just this month completed a regular season sweep of the Bears for only the second time in school history. Mott head coach Steve Schmidt was even more candid than normal after the game. He told MRSN’s Bill Schnorenberg that, in essence, what you see is what you get. The Bears led by as many as nine points in the first half but could not push the lead to double digits. Mott still held the lead with three minutes left in the first half, but were taken to school from that point. The Monarchs went on a 20-4 run that spanned two halves. The Bears were held scoreless for nearly five minutes. Mott (16-11) trailed by as many as 14 in the second half before sprinting out on a 10-3 run of their own to cut the lead to two. The Bears failed to take care of the ball and could not get any closer than down three points from that point. Daryl Bigham led the Bears with 15 points and 13 rebounds, though he did most of his damage early on. Malik Young added 13 points. Mott sophomore Darryl LeVert drew his fourth foul early in the second half and was a non-factor for most of the game. Mott’s game against Delta on Tuesday night can be heard live on MRSN.us starting at 7:30 p.m. The winner will move to the semifinals (also at Delta) to take on the winner of the Alpena-Oakland game.